Flaps are hinged surfaces on the trailing edge of the wings of a fixed-wing aircraft. As flaps are extended, the stalling speed of the aircraft is reduced, which means that the aircraft can fly safely at slower speeds ( especially during take off and landing ). Flaps are also used on the leading edge of the wings of some high-speed jet aircraft, where they may be called Krueger flaps. Extending flaps increases the camber of the wing airfoil, thus raising the maximum lift coefficient. This increase in maximum lift coefficient allows the aircraft to generate a given amount of lift with a slower speed. Therefore, extending the flaps reduces the stalling speed of the aircraft. Extending flaps also increases drag. This can be beneficial in the approach and landing phase because it helps to slow the aircraft. Another useful side effect of flap deployment is a decrease in aircraft pitch angle. This provides the pilot with a greater view over the nose of the aircraft and allows a better view of the runway during approach and landing. Some trailing edge flap systems increase the planform area of the wing in addition to changing the camber. In turn, the larger lifting surface allows the aircraft to generate a given amount of lift with a slower speed, thus further reducing stalling speed. Although this effect is very similar to increasing the lift coefficient, raising the planform area of the wing does not itself raise the lift coefficient. The Fowler flap is an example of a flap system that increases the planform area of the wing in addition to increasing the camber. Krueger flap: hinged flap on the leading edge.Often called a "droop". Plain flap: rotates on a simple hinge. Split flap: upper and lower surfaces are separate, the lower surface operates like a plain flap, but the upper surface stays immobile or moves only slightly. Gouge flap: a cylindrical or conical aerofoil section which rotates backwards and downwards about an imaginary axis below the wing, increasing wing area and chord without affecting trim. Invented by Arthur Gouge for Short Brothers in 1936. Fowler flap: slides backwards before hinging downwards, thereby increasing both camber and chord, creating a larger wing surface better tuned for lower speeds. It also provides some slot effect.The Fowler flap was invented by Harlan D. Fowler. Fairey-Youngman flap: moves bodily down before moving aft and rotating. Slotted flap: a slot (or gap) between the flap and the wing enables high pressure air from below the wing to re-energize the boundary layer over the flap. This helps the airflow to stay attached to the flap, delaying the stall. 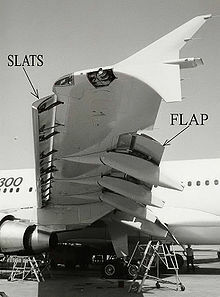 Blown flaps: systems that blow engine air over the upper surface of the flap at certain angles to improve lift characteristics. There are several technology development efforts to incorporate the function of the flaps into a flexible wing, so that the aerodynamic purpose is accomplished without the weight and mechanical complexity of a flap system. The X-53 Active Aeroelastic Wing is a NASA effort to incorporate this technology, and the Adaptive Compliant Wing is commercial development effort. Leading edge slats, usually found at the leading edge (frontmost part) of the wing where it meets the air first, have a similar function as the trailing-edge flaps. Note that a Krueger flap and a leading-edge slat differ in how they are extended. A slat allows a separation from the rest of the wing for energized air to pass from the bottom of the surface to the top, delaying boundary layer separation, whereas a Krueger flap does not because it only increases the wing area and wing curvature. Here, it can be seen that increasing the area (S) and lift coefficient (CL) allow a similar amount of lift to be generated at a slower airspeed (V). Extending the flaps also increases the drag coefficient of the aircraft. Therefore, for any given weight and airspeed, flaps increase the drag force. Flaps increase the drag coefficient of an aircraft because of higher induced drag caused by the distorted spanwise lift distribution on the wing with flaps extended. 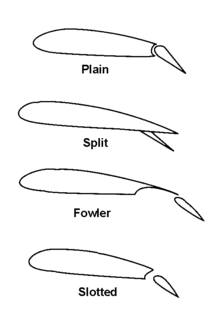 Some flaps increase the planform area of the wing and, for any given speed, this also increases the parasitic drag component of total drag. Depending on the aircraft type, flaps may be partially extended for takeoff. Especially with general aviation aircraft, the use of flaps for takeoff may be optional. This depends on the manufacturer's procedures in the Airplane Flight Manual for a specific takeoff method (e.g., short field, soft field, normal, etc.). Flaps may be partially extended on takeoff to increase the amount of lift generated at a given airspeed, as well as to reduce the stalling speed of the airplane. Together, these two effects help an airplane lift off in a shorter distance at a lower drag penalty than that incurred by a full flap deflection. Flaps are usually fully extended for landing to give the aircraft a slower stalling speed so the approach to landing can be flown more slowly, allowing the aircraft to land in a shorter distance. The higher lift and drag associated with fully extended flaps allows a steeper and slower approach to the landing site. This demonstrates the combined benefit of the higher lift and drag coefficients of fully extended flaps. Some gliders not only use flaps when landing but also in flight to optimize the camber of the wing for the chosen speed. When thermalling, flaps may be partially extended to reduce the stalling speed so that the glider can be flown more slowly and thereby turn in a smaller circle to make best use of the core of the thermal. At higher speeds a negative flap setting is used to reduce the nose-down pitching moment. This reduces the balancing load required on the horizontal stabilizer, which in turn reduces the trim drag associated with keeping the glider in longitudinal trim. Negative flap may also be used during the initial stage of an aerotow launch and at the end of the landing run in order to maintain better control by the ailerons.